Although self-confidence is best developed from within, having confidence in one’s physical appearance is still incredibly important—and for many, that can be difficult when skin conditions give them difficulty. Acne is one of the most common physical ailments in the world and the most common skin condition in the United States, with an estimated 50 million people affected by it to some degree every year. At its very mildest, it’s nothing more than a bit annoying, but the condition can be more than just a physical blemish. 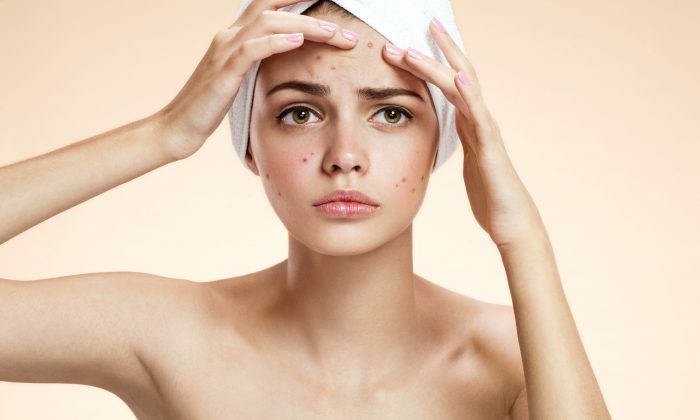 Acne can cause scarring, pain, and debilitating discomfort, adding to the psychological effects caused by the all-too-visible affliction for the 80 percent of individuals aged 11 to 30 who will, at some point, deal with it. For some, acne is a purely medical condition, caused by hormone imbalances and requiring prescription medication to combat. For many, though, there are ways to identify problems with health in other areas of the body that are causing acne. The concept of “face-mapping” has been around for centuries, particularly in traditional Eastern medicine, but a surprising number of acne-sufferers don’t know much about it—if they know anything about it at all. The concept is simple. While there is some crossover and some exceptions to the rule, the majority of breakouts are concentrated to certain zones on a face. Depending on where those breakouts occur, an individual can pinpoint what’s causing them—and without using too many harsh chemicals or trying to fight the symptoms (the acne), can help clear it up at the source. There’s nothing worse than getting acne on your cheeks, because there’s little that can be done from a hormonal standpoint—and because even if your internal health is good, the main cause of acne on your cheeks is something that we all have to do: sleep and talk on the phone. Many people sleep with their faces contacting their pillows to some degree, and there’s no better breeding ground for bacteria (or an easier place to harbor dirt) than your pillow. When you sleep, you’re literally rubbing your face in all the dirt and germs that have gotten on the pillowcase over time—and when you add in that your phone gets pretty darn dirty, every phone call you make transfers more bacteria to an already-sensitive area. Try swapping out your used pillowcase for a fresh one once a week if possible, and avoid taking your cell phone into the bathroom with you. If you have a clean pillowcase and wipe down your phone regularly but still can’t get rid of cheek acne, though, take a look at things like the air quality around you. Chances are, if you’re a smoker, you’re doing some pretty tough damage to your cheeks in the process; that smoke is not only getting into your lungs, but it’s decreasing your health and clogging up your skin. It may dry your skin out a bit, so you might not see it affect your forehead or T-zone as much, but your cheeks may take on the brunt of the damage. 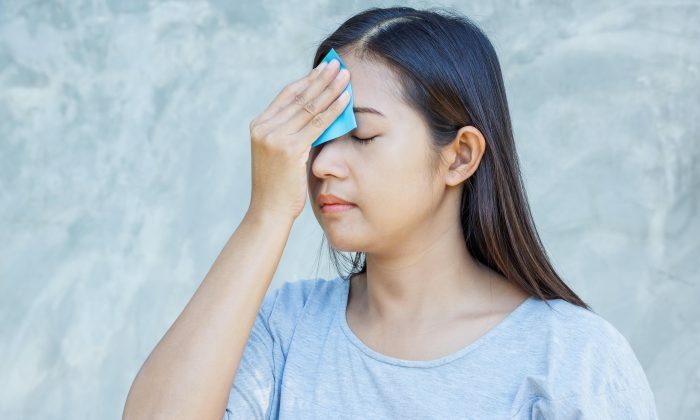 It can be tricky to combat forehead acne for people who are particularly athletic, especially those who like to wear hats or have trouble with sweat. While a good, gentle cleanse at the end of a workout and washing baseball caps more frequently can help with acne in this particular location by decreasing bacteria, it can’t always eliminate it completely—and that’s because the digestive system is closely tied to clear skin in this particular location. Having a poor diet isn’t always the main factor of forehead acne either, but it can be a very serious contributor. Eliminating greasy or hard-to-digest foods, taking a daily probiotic, or just keeping better track of what you put in your body altogether can quickly clear up this trouble area. “Eat real foods and stay hydrated,” says Everyday Health, citing proper hydration and the elimination of things like preservatives and trans fats as quick and simple solutions for those tough-to-banish zits between the eyebrows and the hairline. Add in some cleaner hats and a gentle cleanser once a day, and most spots will clear right up. 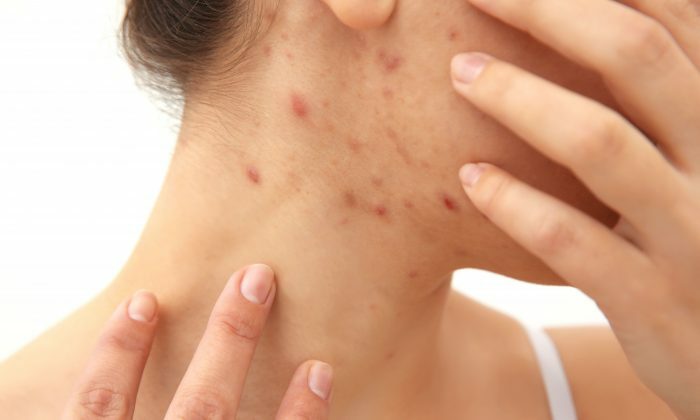 Most women who have dealt with hormone changes, either from menstrual cycles or pregnancy, are well aware of how irritating acne can be on the chin and jawline. It’s an area that gets plenty of exposure to irritants, both from foods and from frequent touching by hands, but don’t fret if you’ve upped your hand-washing and still can’t clear it up; this area is considered particularly troublesome if your hormones are out of balance. 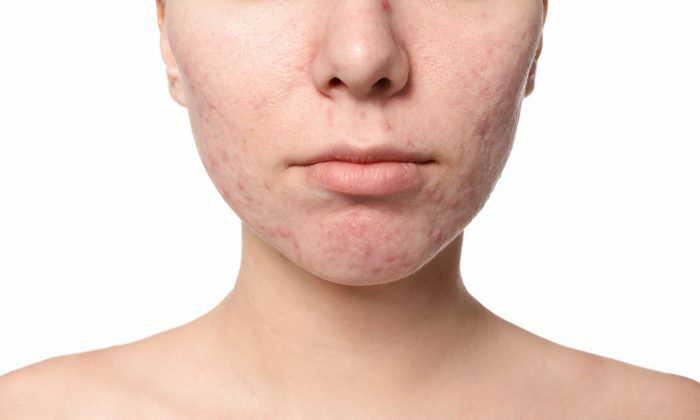 “The hormones that cause this type of acne are fluctuations of estrogen and progesterone, which both vary widely throughout the menstrual cycle month,” explains S. Manjula Jegasothy, M.D., board-certified dermatologist and founder of the Miami Skin Institute, via Self.com. The most common prescription for ridding this kind of acne is a hormonal birth control, but luckily, there are less invasive options to consider before heading to the doctor for a prescription. Probiotic cleansers and other topical washes, as long as they’re used in moderation, do a good job of balancing the body’s pH levels in this area—and they can help treat the breakouts without resorting to extremes. 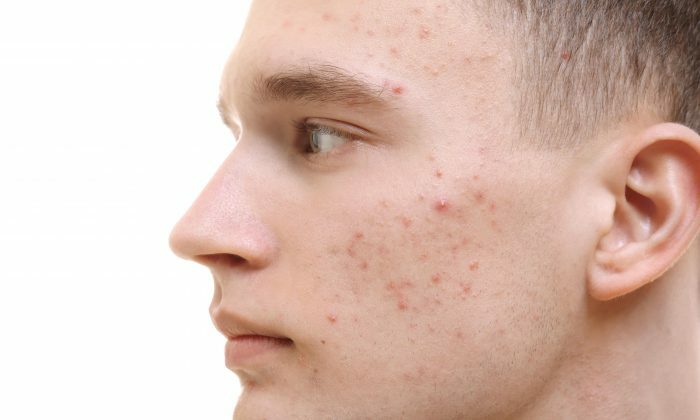 Teen acne tends to show up in what’s known as the ‘T Zone’ more than anywhere else, and it can be both frustrating and confidence-draining—especially if it starts showing up as an adult, too. The most commonly-accepted link to acne on the bridge of the nose and between the eyebrows is to the liver, which can be easily linked to your diet. Eating too many sugary or greasy foods? Not only is your body going to have trouble processing it, but it can cause serious complexion problems and overly active oil production, to boot. The first step that should almost always be taken when it comes to clearing up T-zone acne is to clean up your diet, but making sure to take extra precautions can help as well. While stress doesn’t directly lead to upped oil production in the face, it can cause poor circulation, increased sweating, or poor sleep. Add in that that’s an area of your face you probably touch a lot—especially if you wear glasses—and it’s a breeding ground for acne. Find a nice, gentle cleanser, but don’t overdo it, either. Drying your skin out can actually cause oiliness to go into overdrive, which has the opposite intended effect. 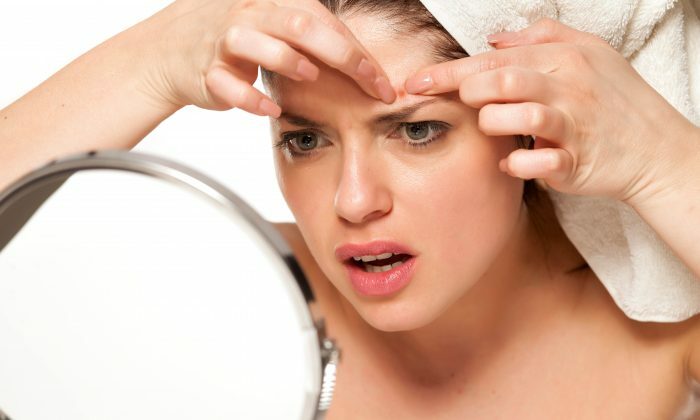 According to Healthline, the T-zone is a seriously prime location for vicious acne cycles. Have you ever felt a cold coming on and realized that you’ve got a few little acne dots right around your eyebrows? 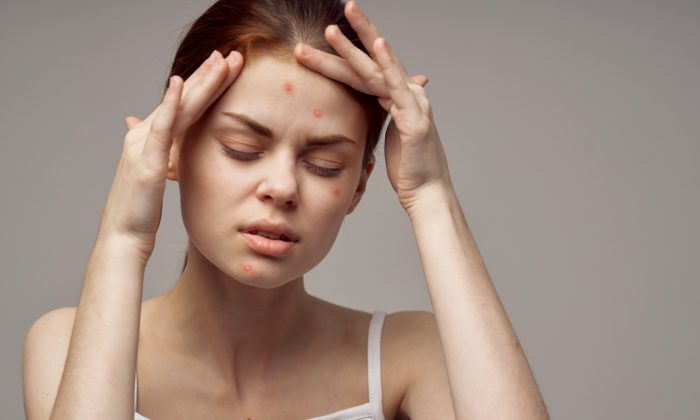 If so, you’re not alone; it’s not the most common location for acne, but that lower forehead area can be a prime indicator that your immune system has kicked into overdrive. There isn’t much you can do about that, but never fear; this isn’t a particularly high-oil producing area of the face, so Skincare by Alana suggests that this one can go away on its own. Make sure to keep any eyebrow grooming to a minimum during a breakout, though; an ingrown hair or exposed cuticle can invite acne to come around to stay if you aren’t careful. To cut carbs from your diet will benefit you in other ways too. Do not forget to avoid excessive amounts of caffeine, alcohol and tobacco.